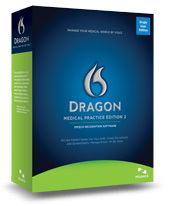 Dragon Medical Practice Edition 2 is the top-ranked speech recognition software available today. When coupled with Nuance’s PowerMic II, Dragon Medical Practice Edition 2 can take your medical practice to the next level by increasing efficiency, streamlining workflow, and providing better patient care by seamlessly integrating into your EHR. Nearly 200,000 physicians worldwide are already using Dragon Medical Practice Edition 2 to instantaneously turn their dictated progress reports, HPI, assessments, plans, and other documentation into digital files. The software is 99% accurate right out of the box and has regional accent support plus medical vocabularies for over 90 specialties and sub-specialties. Using Dragon Medical Practice Edition 2 along with Nuance’s PowerMic II has helped to increase physician satisfaction thanks to ease of use and seamless integration with all major EHR vendors, including Epic, Cerner, Allscripts, NextGen, eClinicalWorks, Meditech, GE, and McKesson. Do you have more than 24 physicians in your practice? Dragon has speech recognition solutions for you too! Work with Dragon Medical Practice Edition 2 and Lower Costs! Using Dragon Medical Practice Edition 2, especially along with Nuance’s PowerMic II, has been shown to increase physician efficiency by 25%, increase physician reimbursement by more than $10,000 per year in an outpatient setting when used in conjunction with an EHR, and to decrease transcription costs by up to $8,000 a year!